Since Mom and Dad are now both retired, they decided to take advantage of the situation and the quality time that remains between them. They planned a 2-month trip and called it their Retirement Vacation. But then Mom suggested I fly to Florida to meet her and Dad there instead. They apparently thought that a couple weeks of quiet, quality time – just the 3 of us! – would be just what the doctor ordered for me. However, it was only on the plane today, as Michigan got smaller and smaller in my window, that I realized just HOW much this was the most BRILLIANT idea ever!! We were at the pool perhaps 20 minutes when Dad decided that he needed a hat to shade his head from the sun. Charming as always, he asked if we needed anything and then he walked inside. Ten minutes later, he was back, happily eating licorice, carrying Diet Cokes for us, a newspaper under his arm – but no hat. Mom asked, “Didn’t you want a hat?” to which he exclaimed, “Oh, that’s a great idea!” and off he went again. After a few minutes she suggested I go in and help. He was grabbing a book off the counter, and I suggested, “Hey, Dad, why don’t you grab yourself a hat for the pool?” to which he agreed and walked into the bedroom. He walked out satisfied, no hat in hand, and said, “Ready?” I said, “You know what, I’m just gonna grab you a hat so your head doesn’t get sunburned,” to which he said that was probably a great idea. Me happy to see Mom and Dad at the airport! 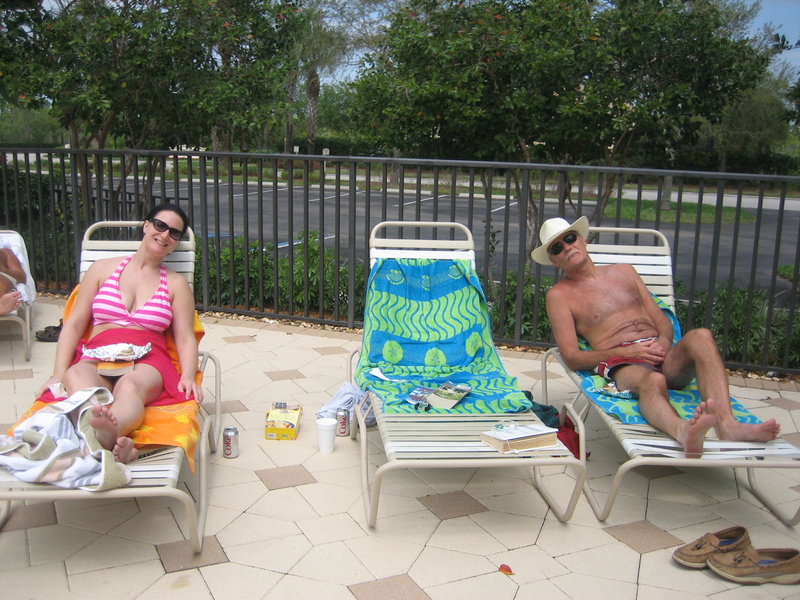 Me and Dad chillin' poolside - with his hat!